Dessert cocktails are a popular after-dinner choice, allowing the diner to satisfy his or her sweet tooth without the heaviness of a larger dessert option. Among dessert cocktails, chocolate-based drinks have surged in popularity. 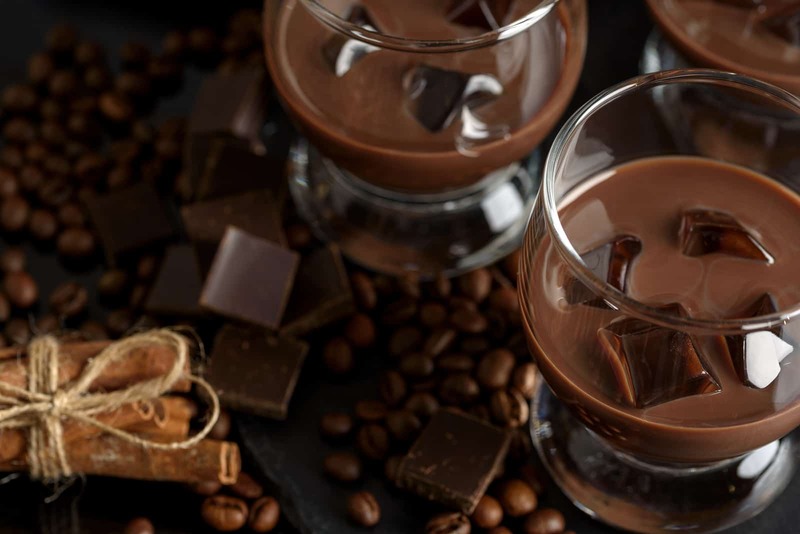 Chocolate liqueurs range from traditional crème de cacao to those with nutty or even spicy notes. Godiva, the renowned Belgian chocolatier, produces its own chocolate liqueur, adding a decadent and mouth-pleasing flavor to cocktails of many types. Here are some of our favorite chocolate cocktails to enjoy after a meal or as a nightcap. These cocktails are also fantastic for holiday parties. Rich and satisfying, this chocolate-based martini is a sweet spin on a time-honored classic. It features two chocolate spirits and splashes of vanilla and cream to round it out. To prepare, add all the ingredients except for the chocolate syrup to a cocktail shaker filled with ice. Shake vigorously to combine. Garnish the cocktail glass rim by dipping it into a flat plate filled with chocolate syrup. Strain the cocktail into the glasses and serve immediately. Tiramisu is a luxurious dessert treat hailing from Italy. In its cocktail form, this recipe blends two chocolate liqueurs with coffee flavor and a dash of Amaretto, the nutty Italian spirit that has been enjoyed as a digestif for centuries. Gently add each ingredient to an ice-filled glass. Martini glasses or coupes make great choices for glassware. The different layers will slowly merge, creating the flavor and appearance of tiramisu. To give the cocktail even more richness, add a splash of cream. Dust the top of the cocktail with cocoa powder as decoration. Serve immediately. Citrus is, of course, the traditional tart flavor of the classic margarita. Citrus flavors pair nicely with chocolate. Add in some silver tequila and the result is a sweet, complex spin on a summertime classic cocktail. This drink is a great after-dinner sipper with all the richness of a dessert, but without the belly-busting effect. To begin, prepare the glassware by combining equal parts sugar and cocoa powder in a small dish. Moisten the rims of margarita glasses with a lime wedge, then dip the rims into the sugar/cocoa powder mixture. Set glassware aside. Pour the tequila, citrus juices, chocolate liqueur, and bitters into a blender, add ice, then blend until smooth and creamy. Pour into the rimmed glasses and garnish with shaved chocolate sprinkled over the top. Optionally, the bartender can add swirls of chocolate syrup to the individual glasses for an even more decadent flavor and appearance. Read more awesome recipes here. Who Can Benefit from a Private Bartender Service?